AZW was basically the MOBI format using the high compression option. AZW1 is another name for the topaz format (Also called .tpz). AZW3 is another name for KF8 This format first came out for the Kindle Fire. This is the primary format for most current Amazon Kindle devices but they can also read the other formats. AZW4 for a new version for textbooks (similar to PDF). AZK for a special iOS version for Kindle Reader on Apple products. 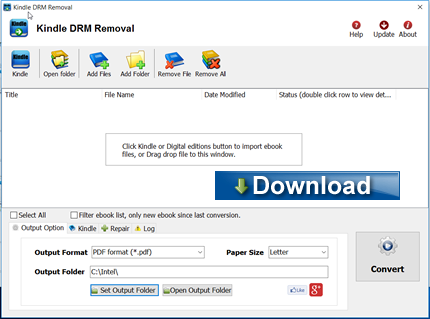 Kindle DRM Removal quickly and easily remove azw/azw1/azw3/azw4 ebook DRM protection with 1-click. it produce a new nodrm ebook file that user can convert to EPUB/PDF/TXT/RTF format ebook using Calibre, read them on iPad, NOOK, Sony Reader or other device without limitation, user also can print converted Kindle ebook. Create a new nodrm ebook file without DRM, no need to backup the source files.